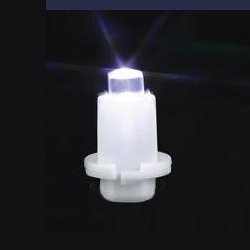 Made up of one bright LED and a holder giving out white light, installed in various vehicles as dashboard light. 1. Emitting color: super white. 2. Forward voltage unit: 13.2V. 3. Totality luminous intensity unit: 1.5LM. 4. Single LED intensity unit: 900mcd. 5. Dominant wavelength unit: X: 0.28nm, Y: 0.28nm. 6. Viewing angle unit: 95deg. 7. Color temperature unit: 8800K°.